Electronic Attack Squadron One Three Zero is the oldest electronic warfare squadron in the United States Navy. 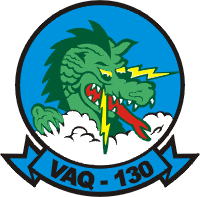 VAQ-130 adopted the nickname “Zappers” and the Zapper Dragon insignia when the squadron was originally commissioned as Carrier Early Warning Squadron THIRTEEN (VAW-13) flying AD-5Qs in 1959. Mar 1975, Zappers got into her brand new EA-6B Prowlers and was actively supporting Electronic warfare onboard various carriers including CVN-68 USS NIMITZ, CV-59 USS FORRESTAL,CV-62 USS INDEPENDENCE, and CV-63 USS KITTY HAWK. In 1986, the Zappers completed transition to the Improved Capability II (ICAP II) version of the aircraft, which incorporated the ALQ-99 Tactical Jamming System and integrated the High-Speed Anti-Radiation Missile (HARM). Zappers was involved in many combat mission including Operation DELIBERATE FORCE and DELIBERATE GUARD, Operation Southern Watch and Iraqi Freedom. During this six-month deployment of Iraqi Freedom, the Zappers fired more than 35 HARM missiles in direct support of air strikes. In mid February 2011, the Zappers began sending personnel TAD to NAS Lemoore, CA, and also schools at Naval Air Station Whidbey Island (NASWI) for transition training to the EA-18G “Growler” aircraft. Aircrew from the Zappers began syllabus flight training on March 7, 2011. The Zappers completed their transition to the EA-18G in February 2012 and then obtained their Safety of Flight in 2012. Airwingspotter was fortunate to catch the Zappers in numerous occasions. The 1st was taken in Ellington Field, TX when they were still flying the EA-6B ICAP II. In 2011, we caught the Zappers again in NAS Kingsville , TX but this time they got the brand new EA-18G Growler. When the 2 Zapper birds came in for the airshow, they did a good carrier break and than landed. As we can tell from the pictures those aircraft was fresh out of the factory. The CAG bird have really beautiful markings which we took lots of good static shots of both aircrafts. Recently, Zappers was again spotted in Ellington Field , TX and we can see the current ( 2014) scheme of their 500 CAG bird and 2 line birds. These birds came into Ellington Field for transitional flights to NAS Key West.